We have more games to enjoy than ever before thanks to the indie renaissance that our industry is currently experiencing. This is especially true in the number of and variety of games available on digital stores such as the App Store, Steam, and Xbox One Store. While the big budget developers continue making games that fit whatever their investors and publishers consider “safe”, small devs are taking risks by working with all kinds of genres and ideas. One such genre is horror. While horror games were never completely dead, the last decade or so saw a shortage of quality examples while others genres (like first-person shooters) rose to the top. However, thanks to the indie scene, gamers who love horror games have plenty to choose from these days. In fact, they’ve become one of the most popular type of games among players and YouTubers across the globe. The following are a few reasons why horror genre, like a zombie in Resident Evil, is back and stronger than ever. One reason games group into genres is because different genres offer different types of gameplay experiences. If you want to test your ability to plan strategies and execute tactics, jump into a real-time strategy game. Those who enjoy pushing their reflexes may like a 2D platformer (which is another genre that’s also seen a huge revival in recent years). Whatever your taste is, there’s something out there for you. Much like their movie and tv counterparts, horror games are enjoyable because they shock us and give us a rush of adrenaline. There’s nothing quite like being chased by supernatural demons or stealthing down a dark corridor where you know something may leap out at any second. That is why these games tend to put the player in a vulnerable state, be it low ammo, overly strong monsters, etc. The first few Resident Evil games are a prime example of this. Horror games typically are accessible by players of any skill level. The same can’t really be said for other game genres like fighting games (that typically require being able to execute complex button sequences rapidly), or Madden NFL games which require real knowledge of football. If you can handle the basics of a controller, you’re ready to play a horror game. This accessibility has allowed people who never considered themselves gamers to finally give a video game a try. Because of that developers are breaking new ground figuring out how to make horror games accessible but not boring. 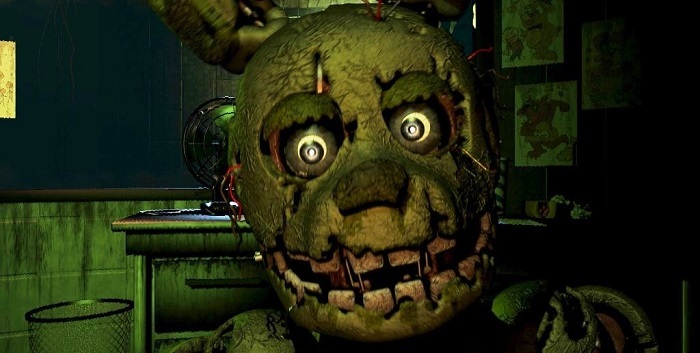 In Five Nights at Freddy’s, all you really do is watch security cameras and make sure the electricity doesn’t run out. As simple as it sounds, the 2014 indie hit is considered one of the best horror games made in recent years. If Aristotle were alive today, the horror genre might be his favorite. He believed that the most important element of a story is the characters. Without interesting characters in conflct there cannot be an engaging plot. Horror games’ strength is that their stories often revolve around on the character’s survival and development as unexpected revelations come about. Dead Space, for example, seems like it has a familiar plot at first. The main character, Isaac Clarke, finds himself stuck on a spaceship where all the crew has been slaughtered by people infected with an alien virus. Aside from the amazing sound and level design, what keeps players hooked is the unfolding story of how the Church of Unitology and the mysterious Marker relic are central to this epidemic. Near the end of the game, players are shocked to discover that the Marker was influencing Isaac the entire time in ways few could have expected.